Android has an awful lot of games, and each month new ones are released. Knowing which ones are any good can be tricky. So we’ve put together a list of the best games that we’ve been playing – we’re only adding two or three each month to ensure that only games we’ve played make it onto the list. This month we’ve added Reigns: Her Majesty, Arena of Valor, and Run Sausage Run! 2018 is here, and with it brings the promise of another entire year of awesome Android gaming. While there are a few exciting upcoming titles on the horizon to look forward to, we’ve been busy gaming over the holiday season to recommend some fresh titles to kick off the new year. Run Sausage Run! Is an endless runner with a culinary twist. As a plucky sausage attempting to escape your fate on the dinner table, you’ve got to dash through the kitchen dodging deathtraps like knives, tenderizers, searing hot grills, and various whirling blades. The bloody but cartoony visuals and tongue-firmly-in-cheek humor makes Run Sausage Run! stand out from the many endless runners out there by force of personality. The fantastic soundtrack and variety of power ups help keep the high-score chasing gameplay interesting over time and there are various outfits and skins to unlock to personalize your sausage. In the game of thrones, you swipe or you die. And sometimes you still die, but it’s always fun. A sequel to Reigns, which was an entertaining mix of kingdom-sim and Tinder-style swiping, Reigns: Her Majesty puts you in the queen’s fancy shoes this time, but the basic premise is the same—using a selection of cards and items (new to the sequel), you make decisions that attempt to balance various factions in your kingdom, such as the people, the army and the church. And of course, your own desires. Reigns: Her Majesty works best played in roughly 15 minute sessions that give the impression of an episodic progression through a story of intrigue, tension, and unexpected twists. Although it’s a game that makes you think if you want to work for a perfect ending, I never got too stressed with the decision making because of the clever writing which delivers even missteps and misfortunes with a delightfully dark humor. Arena Of Valor is a 5v5 MOBA (multiplayer online battle arena) game developed by Tencent games, makers of the smash hit League Of Legends. In China the game has been available in various incarnations, but it has only recently made its way to western markets. Although Arena of Valor shares many characteristics with League of Legends, it benefits from many tweaks that optimize it for mobile play. Matches on Arena of Valor are only 10 minutes long compared to the more established MOBA games which can often run to around 45 minutes per match. The controls are simple and easy to learn thanks to a comprehensive tutorial. This makes Arena of Valor both a great introduction to MOBAs and perfect to pick up and play in short bursts. Since it’s easy to learn and matches don’t take too long, you won’t lack for teammates (and opponents) among the game’s huge and fast-growing userbase. As someone who’s normally turned off by both the complexity and time-sink of more established MOBAs, Arena of Valor still managed to hook me in with its accessibility. Another selling point for Arena of Valor are its playable DC universe characters. But if you want to get this game just to pit Batman or Wonder Woman against the game’s roster of original heroes, be prepared to grind (or pay), as it requires a lot of gaming time to unlock the DC heroes. Thimbleweed Park is a serious game of the year contender, at least where mobile gaming is concerned. This adventure game by Monkey Island creator Ron Gilbert spins a compelling yarn, reminiscent of the X-Files and Twin Peaks, about a pair of idiosyncratic FBI agents investigating a murder mystery in an equally idiosyncratic town. The puzzles are challenging, and the ability to control multiple characters offers some creative and complex solutions. But if you just want to drop the headscratchers and enjoy the stylish retro graphics and quirky sense of humor, there’s an easy mode too. For fans of story and puzzles alike, Thimbleweed Park is a delight, and well worth the money. The Shadow Fight series has always stood out as one of the best examples of the fighting game genre on handheld devices, and we’ve bigged up Nekki’s Shadow Fight 2 before. The sequel brings all the action into the light, dispensing with silhouettes and fleshing out the warriors with great graphics and a variety of fighting styles, armor and weapons (swords, axes, spears, hammers etc.) for the clash of steel. The gameplay is intelligent enough so that you won’t get far with button-mashing in this game. It’s kind of like a 2D Soul Calibur title. Winning Shadow Fight 3 requires proper form and timing to succeed, especially if you resist the in-app purchases. Progressing, on the other hand, is annoyingly locked behind a loot-box style system that reward you with currency and items. Thankfully, they are unlocked with time as well as money, so if you’re just willing to put down the game once in a while, the goodies will come to you automatically. Lineage II: Revolution is a mobile version of a hugely popular Korean MMORPG, a genre most familiar in the West from World of Warcraft and Everquest. Netmarble have really been pushing their mobile game internationally with high-budget ads (how much does Conan O’Brien go for nowadays? ), and I checked out Lineage II: Revolution to get a taste of the game beyond the hype. Visually lush and richly detailed, it’s a sumptuous feast for the eyes and boasts of epic battles with over 100 fighters on the field of battle, or defending a fortress. There’s a strong social element where able to join clans and fight alongside your buddies against your rivals. RPG class and race character options are pretty traditional – be a human warrior, elven mystic, etc, but there are higher level options that unlock additional professions. Since Lineage II: Revolution is still pretty new, there’s a chance to get in early to this MMO and rise to power as a in this seriously pretty fantasy world before the first players start to dominate. If you’re going to fight to the top though, be prepared to grind—a lot—or shell out for those ubiquitous in-app purchases. An icy blast from the past as the cold sets in this November, as I had the pleasure of picking up Icewind Dale: Enhanced Edition on sale and re-revisiting this classic Dungeons and Dragons-based RPG, prettified and updated for modern mobile devices. Icewind Dale stood out for its beautiful scenery and evocative music and the Enhanced Edition gives all the good points a nice polish, as well as adding a ton of new character options and interactions that add plenty replay value to an otherwise linear game. 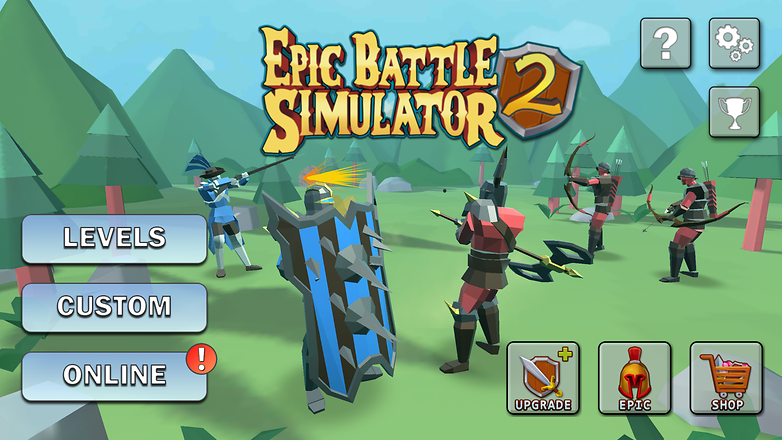 Despite the ‘battle’ in the name, Epic Battle Simulator 2 isn’t so much a strategy as a fun physics sandbox where you place a horde of blocky warriors of varying types (knights, wizards, riflemen, artillery, monsters etc) against each other and then just let ’em have it, enjoying the ensuing mayhem. A nice time-killer with quite a few different combinations for interesting battles right from the start, though there are special fancy units that you can purchase if you feel like turning up the epic-ness. There’s a glut of Play Store games set in Games Workshop’s uber-popular dark science-fiction Warhammer, 40, 000 universe, but Pixel Toys’ Warhammer 40, 000: Freeblade towers above the rest on massive armor-plated mecha-legs. Freeblade puts you in the role of an Imperial Knight, a walking humanoid arsenal of guns, missiles, and whirring blades, and pits you against waves and waves of aliens and demons in a fun and viscerally violent on-rails campaign. Although quite linear, the battles flows thick and fast and always looks cool, and the game even supports the Razer Phone’s 120Hz display. The graphics are great and the tap and swipe controls to activate different weapons make controlling your massive machine quick and easy. 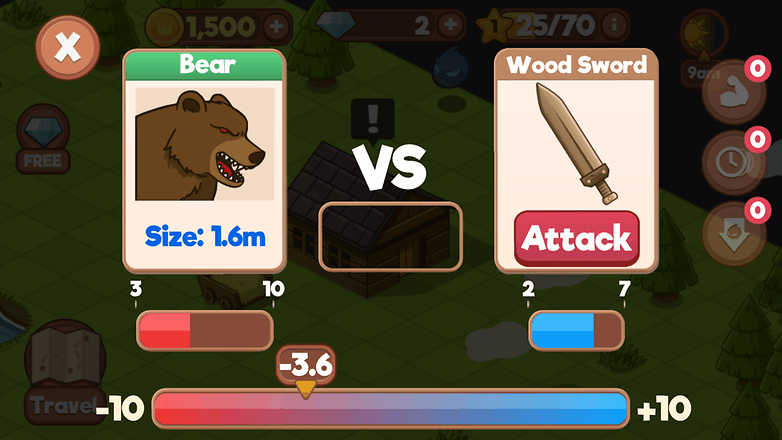 In-app purchases can make your Knight tougher or visually distinctive, which is mainly an advantage in the PvP multiplayer, but there are plenty of single player missions to keep the blood flowing and the skulls dropping in solo play. This Orc-tober we’ve been battling against fantasy gaming’s favorite fanged foes, the orcs, in the mobile version of Middle-Earth: Shadow of War. Released ahead of Monolith’s AAA version, the free mobile game is a meaty offering all on its own. Essentially a strategy game with action RPG elements, you control heroes drawn from Shadow of War, its predecessor Shadow of Mordor, and the Lord of the Rings film trilogy in a series of small scale battles. As in the PC/console version, the game uses the Nemesis system and Talion can enslave orcs and use them for the cause of good. Our nostalgic trip through Sega’s back catalog wouldn’t be complete without a game that sucked up years of my misspent youth: Golden Axe. The classic beat-em up has joined many of Sega’s finest on Android, and plays surprisingly smoothly on the smartphone. Despite being a much older game than Shadow of War, Golden Axe feels much more action-packed, as you’re in control of every sword-swing and spell-sling. After just a few minutes of getting used to the controls on mobile, I was back in the dragon-saddle in no time. Golden Axe is free on the Play Store if you can put up with in-game ads, though you can pay to eliminate them. Sky Force Reloaded is the latest version of a popular scrolling shooter that mixes classic arcade gameplay with modern graphics, an addictive upgrade system and tongue in cheek-humor. I hadn’t played previous iterations, but Sky Force Reloaded had me hooked in seconds. No matter how many times I was shot out of the sky, I found myself more than ready to jump back into the cockpit. Best $0 ever spent. Though it’s strangely named, this is a great game. 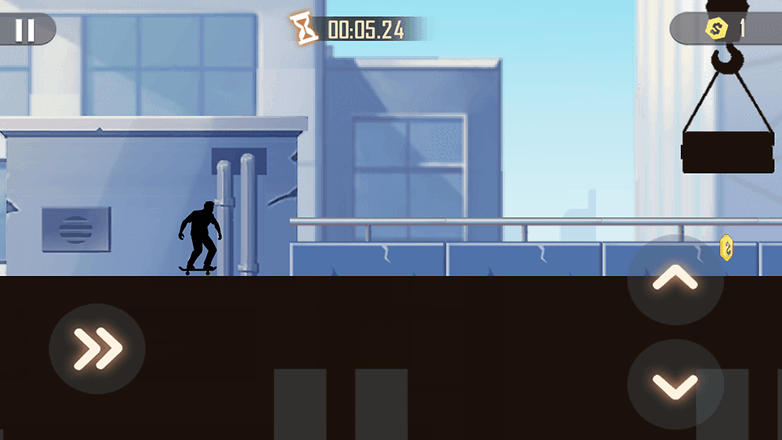 You play as a skateboarder, or rather, his shadow. And as you skate along, you do tricks. While the occasional ads can get on one’s nerves quickly, you’ll find yourself addicted anyway. Once you get used to the gameplay, you won’t be able to put it down. Get it on the Play Store, free with in-app purchases. Knife Flip is a simple, but not quite original, game which involves flipping knives of various types. It’s simple in theory, but it can be a bit challenging in practice. 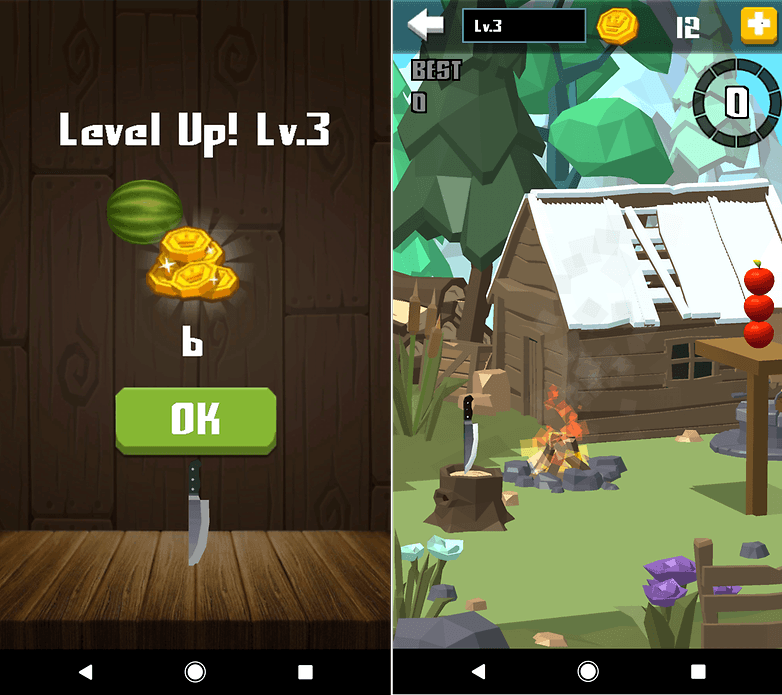 You advance through the game by doing tasks like fruit cutting, and hitting a target. This title just goes to show that impressive graphics aren’t necessary in order to hold one’s attention. The only drawback is that the ads are annoying, but that’s not uncommon among free Android games. As the name suggests, this game takes place in medieval times, but in a sort of fantasy universe. Right at the beginning of the game you must face, and defeat, a goblin. It offers quests in the classic RPG style, and the opportunity to buy castles. There’s a lot of fighting, and if you have the patience for going on quests and building fortunes, it’s well worth a try. Get it on the Play Store, completely free. The new Elder Scrolls: Legends has finally arrived on Android phones as of last week. If you’re familiar with Magic: The Gathering or Hearthstone, this is a game much like those. This card battle game allows you to play offensively or defensively, depending on your style, thanks to having multiple lanes. The game is easy to learn, but very strategic, so it can take a long time to become truly good at it. If you have patience for a card battle game and you’re a fan of the franchise lore, this is a must-have title. Get it now on the Google Play Store. Whether you’re nostalgic for the SEGA era or a fighting game fan, you’ll love this game. You’ll advance through stages, and of course, rescue your fiancee. A little romance in a ninja game can’t hurt, after all. Whether or not you’re a fan of the console game, you’ll find yourself caught up in the story and gameplay quickly. If you’ve grown too used to the experience of playing on a console, or you’re into games with more modern graphics that take your breath away, this may not be the game for you. It’s charming in a retro sort of way, and a great way to waste some time. Have you ever wanted to be a hero? This is a heroic fantasy game, with medieval elements like stories of magic, castles and other typical elements of the genre, that allows you to fight with your character. If medieval fantasy happens to be your thing, this is a great choice. It’s not a game you can pick up quickly, as it’s a bit complex and takes a while to get used to. But, it’s a pleasant game to play and offers several types of gameplay, like PVP for competitive players. The graphics are a bit simple, even childlike, but still provide a nice experience. As part of Sega Forever, the collection of classic games recently released on smartphones, Sonic the Hedgehog is making a comeback. This time around, you can expect the same classic gameplay as the original, but with a heavy dose of nostalgia. You’ve got two little on-screen joysticks to work with, and perhaps surprisingly, it’s not frustrating to play on a phone. Sonic and the other games released with Sega Forever come with online leaderboards and cloud saves as part of their modern makeover. The game is free to play, but the ads are a bit annoying. You can get an ad-free experience for $1.99. For fans of arcade games, this one’s a winner. Turretz provides you with a space battle that’s reminiscent of the style and graphics of Galaga. The object of the game is to protect your planet by using turrets to defend it. You actually move the planet around to dodge enemies, and as you shoot them, you rack up money to buy more weapons. The gameplay is simple and the controls are easy to get the hang of, which is good, as you’re dumped straight into battle after only a minimal tutorial. It’s action packed and you’ll need to think strategically to do well. The game is free and offers in-app purchases. Over a dozen Angry Birds games have been released, each with a fairly unique take on the franchise. 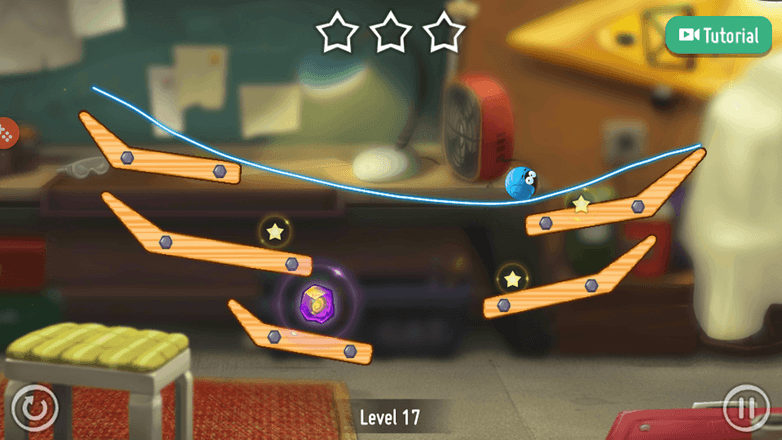 Some involve racing, some involve Star Wars, and now we’ve got an entirely different experience in the latest release: Angry Birds Evolution. It’s just as ridiculous as all the others, and that’s what makes it wacky and fun. If you’re eager to punish some pigs, you’ll find yourself in luck here, as the game jumps straight into battle and is easy to get the hang of. The difficulty level increases over time, and you can level up your growing gang of birds as you go along. You just point your bird, and it shoots off and bounces around the combat zone like a pinball. The game is free and offers in-app purchases. Are you a speed freak? 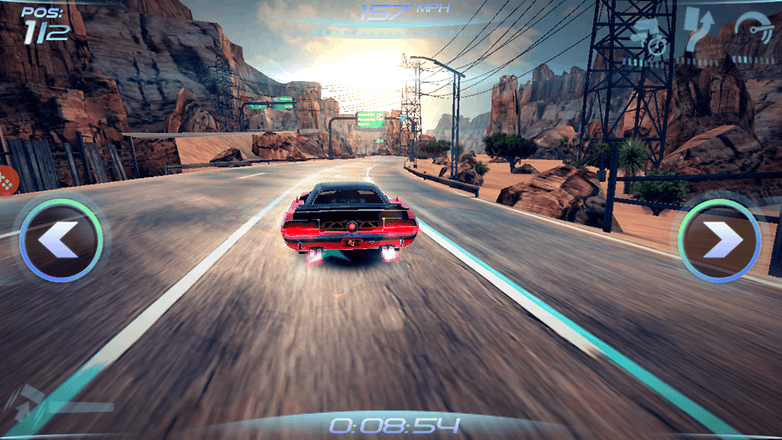 The new Asphalt game just launched by Gameloft is the hottest racing game of the moment, and it focuses on the wild world of drag racing. You can drive across several cities, like Paris, New York and Hong Kong. And for a challenge, you’re faced with brutal weather events, like rain and snow storms. The single player mode is fun, but multiplayer is much more thrilling. You can go up against up to three other players at once. In Asphalt Street Storm Racing you can bet pink slips to win your opponents cars in drag races, and amass a little collection of your own favorite cars. The graphics in this title make the action come to life, thanks in particular to the light reflections. The details in the cities are so well done that it makes you almost want to slow down to take a closer look, but the races are just too much fun to do that! As you can imagine, this game is for Pokémon fans. We leave aside the adventure of Pokémon GO and the many Pokémon available there to hunt, and we focus on Magikarp, the most useless Pokémon. Fans of tamagotchis could well find something here that they like. The goal is really to evolve your Pokémon by taking care of it. Training will be part of your daily routine and this may be a problem for some, especially Pokémon fans who want to see many Pokémon everywhere, not just the worst in history. At first glance, we might think that this game is aimed at children as the graphics are simple: light colors, fun drawings and so on. This does not stop it from being pretty enough to attract young and old, whether fans of Pokémon or fans of tamagotchi. This is for all the sci-fi fans and wannabe spaceship pilots. You feel a bit like the resistance in the Death Star attack, but the difference here is that you are not fighting for such a noble cause: you are a mercenary in a world where chaos is king. While the scenario is a bit bleak, in the end that doesn’t matter, as the game is entertaining and free. One drawback: piloting is quite difficult, so it takes a lot of time (and patience) to get used to. If you want to download the game, remember to connect by Wi-Fi because the game is at least 1 GB. The environment is relatively dark (as it’s set in space) so playing in a very sunny environment may not give the best results. Nevertheless, you will love the graphics when you are able to see their full potential. It’s beautiful, it’s fast, it’s fluid and it’s exactly what one expects from a game of this type. Happy Portions is like the classic tic tac toe, with a twist. Two eight-year-old twins came up with this game in a restaurant, and it’s really something. The first thing they’ve changed is that the nine squares are split into sections: two, three or up to eight, depending on the difficulty level you’re after. When it’s your turn, you mark one of these areas with your color, and the goal is still to get three adjacent areas in a row to connect. For example, you get one point if you can make the left sides of three in a row your color. So far so good, right? But, it gets more difficult: both players are able to spin each of the nine squares. Now it’s really tough, as all of the effort that went into making a triple chain can be gone with just a twist. You can play in single player mode or multiplayer mode. It’s not possible to have more than two players, which is a little sad. The game is free, but there are ads. RPGs, or role playing games, are often set in fantasy worlds, and Tempest finds its home in a swashbuckling pirate world. 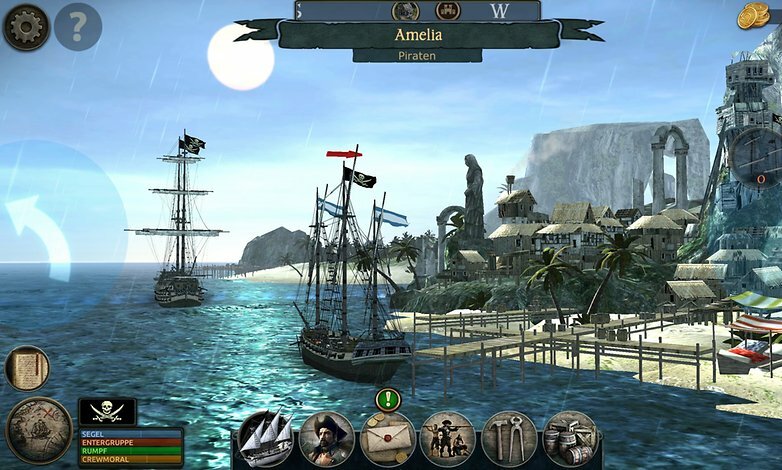 In this open world RPG, you fight against other pirates on the high seas, fulfill orders and work your way up to better ships and a better crew. The very complex game gives you an overview of the most important functions in the first few minutes. If you’ve ever wanted to captain a pirate ship or play a role playing game with great graphics, this is a sure bet. Tempest costs $7.99, which isn’t exactly cheap. There aren’t any ads or in-app purchases, though. Do you prefer an endless runner or pre-made levels? You can have both with Blue Edge. 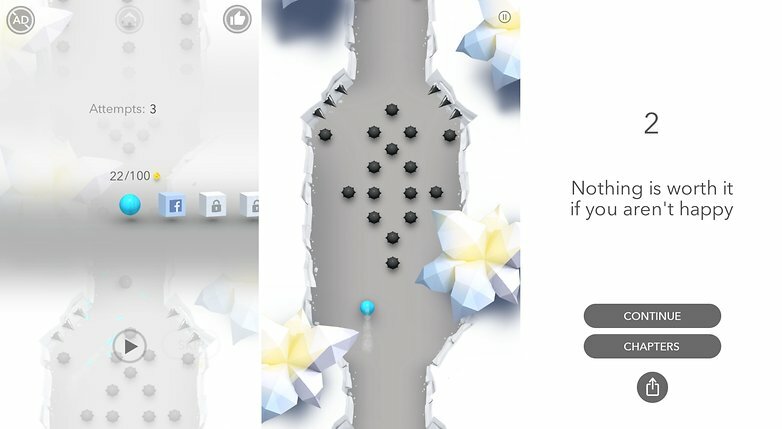 In principle, the game is quite simple: you guide a ball through a path full of obstacles that would cause it to shatter. The goal is, naturally, to make it as far as you can. In arcade mode, Blue Edge is an endless runner, while the story mode is a joy. Having fun with the app is free, but you’ll have to suffer the ads. Lumino City is a game with really impressive graphics. It is now on Android, whereas before it was only on Mac, Windows and iOS. The story revolves around a little girl called Lumi, who is trying to find her grandfather. The game environment is an intricate city painstakingly crafted by paper and scissors. This alone should have taken the developers three years. 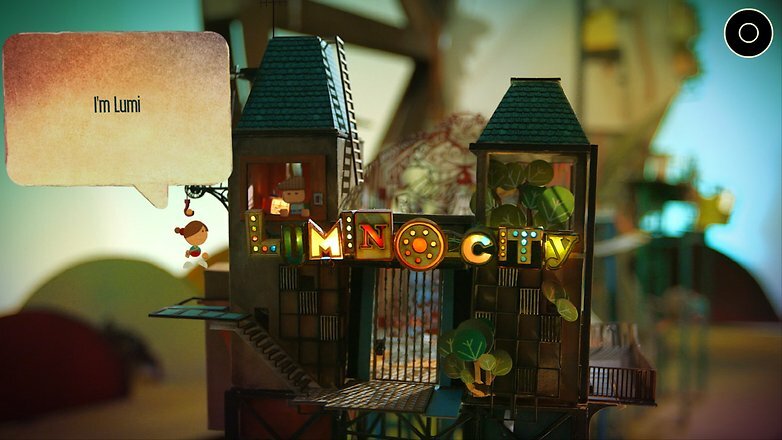 The graphics take the paper aesthetic and unique depth of field and run with it, giving the Lumino City a distinct look. The puzzles and riddles aren’t always easy, but they’re manageable. The gameplay lasts about 10 hours, and it’ll cost you $4.99. It’s definitely worthwhile for fans of puzzles and riddles. Originally available only on iOS, Super Mario Run only arrived on Android very recently. Fans of the good old plumber in overalls will be delighted to find Nintendo’s big star back in action. I’m excited that the classic is back! You control your character in the standard view and advance it to the right and left, picking up pieces and jumping in all directions. In short, Mario as we love and expect it to be. The problem is that after finishing several levels, you have to pay $9.99 to progress the following levels. A good game deserves its price, certainly, but it runs the risk of scaring away some users. Another element that may be annoying: you must have a stable internet connection in order to be able to play. Graphics are generally not the priority in mobile games, so here we find the graphics to be pretty but relatively simple, which is actually a good way to plunge back into the feeling of the Mario of yesteryear. NOVA Legacy is a futuristic FPS, so you have to meet two conditions to enjoy this game: love shooting bad guys, and love science fiction. You will find yourself in a spacecraft and fighting aliens here. At first glance, there’s nothing very original in the plot – Hollywood has been offering films of this sort for years. Yet, the game is fun, the gameplay is simple and enjoyable, and the different game modes keep things fresh. You probably will not be disappointed, but some existing fans of the series don’t like that it is so different (or not as good as) NOVA 3. It’s futuristic, as one might imagine. All in all, the graphics are successful, although we might have expected something a little more realistic. That said, the gaming experience is still very good. This game is for fans of the fighting genre, with martial arts and hand-to-hand combat as the focus. You need to have a love of fantasy to get into the game, because it isn’t based in reality, though it clearly draws inspiration from the East. This game allows you to become a legend of martial arts: choose your school and confront your enemies in this MMO. You have different skills, sometimes even mystical one, which make the game really interesting. You can walk, ride or even ride a bird, but the important thing is to know how to fight. Players reported finding several bugs – which we didn’t experience – but the game does take a long time to load. The graphics take us into an Asia-inspired fantasy universe. The graphics are successful and very pleasant, especially in scenes where nature plays a role. We have to make an admission this month – Golf Clash is still utterly addictive and taking up far too much of our time. Nevertheless, we’ve made just enough room in our schedules to hunt out some new games for you to download this month. Among the new entries, we have a physics-based drawing game and a hover racer that’ll make you reminisce about Wipeout on the original PlayStation. 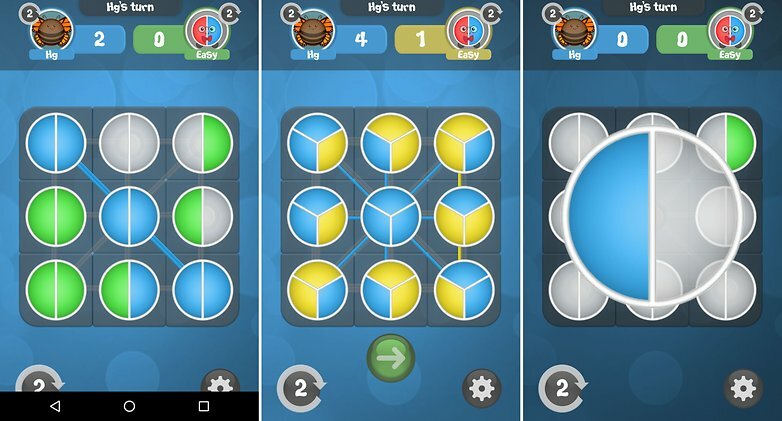 Rolling Snail looks like a simple drawing puzzle game, and it is – but that doesn’t necessarily mean it’s easy. Your aim is simple; make sure the snail collects a few stars and a weird-looking portal box thing on each level. However, to do this there are only a few things at your disposal that you can use. Most simply, you can draw a line on the screen that the snail will then roll along. This is the essence of the game. You can also draw a rock shape so you can drop it on the snail and propel it in whichever direction you need. Thirdly, you can also remove lines that you’ve drawn, or cut through them, to alter the trajectory of your snail. That’s about it. It’ll likely take you a few tries to get your head around the general approach needed for the first few levels but you’ll quickly get into the swing of how to start thinking about making it to the portal on each level. There are ‘potions’ and other power-ups you’ll be able to collect as you progress, but they’re not really necessary and all happen incidentally as you collect coins and gems as you progress. RivalGears is a spin on a racing game that will bring back some early 90s nostalgia for anyone who remembers Wipeout, and anyone that doesn’t will just enjoy a high-energy hover racing game. Driving is straightforward – just use the arrows to change lanes, and tap the boost button when it appears. There’s nothing revolutionary in the upgrade mechanisms and customization options, but there are enough different daily challenges, league events, one-off challenges and other game modes to keep you busy for quite some time. Racing does consume fuel though, and you get that back either by waiting or trading in some diamonds. You can buy different cars too (of course) and it’s entirely possible to keep upgrading and customizing them without ever paying any real cash via an in-game purchase. Each car component essentially has three different levels of upgrade, with each of those levels being broken down into five parts. Once you have the five, you can upgrade that component level – and if you’re missing any of the parts required for an upgrade, you can buy whatever you need with your race winings or diamonds. With lots of different game options – all online racing against other real people – and granular upgrades, it’s one racer that could keep you busy for quite a while. January saw us spend far too much time playing Dirt Xtreme and WarFriends, but with those minor addictions now beginning to wane, it’s time to add a couple of new games into the mix from across the last month. This time, we’ve got a super-simple timewaster for you, and an altogether more creepy adventure game, and a golf game that’s taking the mobile world by storm. Golf Clash isn’t the ultra-realistic and potentially dull golfing game you’ve been waiting for but it is an awful lot of fun, and paces its progress just about right. As with any golfing game, your aim is to get the ball in the hole, but unlike others, each game consists of just one hole and you’re put in a head-to-head battle against another real-life opponent. Win and you take home some extra coins, which are used for entry into competitions. The first level you play only costs 50 coins, but they quickly unlock and get more expensive. Lose all your coins and you’ll have to watch a video ad to get 50 more to enter the cheapest competition. As you play for additional coins, you’ll want to upgrade your clubs and unlock new ones. You, essentially, do this by spending coins and diamonds on new items or abilities, and when you win a round, you’ll unlock a ‘Tour Chest’ that contains a few goodies. You need to wait a set time for these to unlock though – the more valuable the contents, the longer it takes to unlock. Of course, spend a few more diamonds and you can skip the wait. 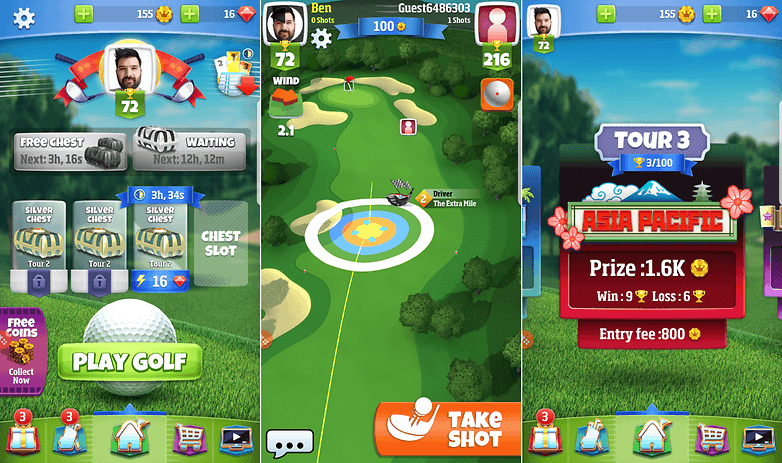 Golf Clash is free to download, and simple enough with its controls to be a truly enjoyable and fun golfing game. It’s a shame progress is quite so slow after the first few levels of upgrades, but how fast you achieve that really depends on how good you are, so perhaps the problem isn’t with the game. Future updates include a new Tournament mode, but there’s already multiple leagues to keep track of your progress. 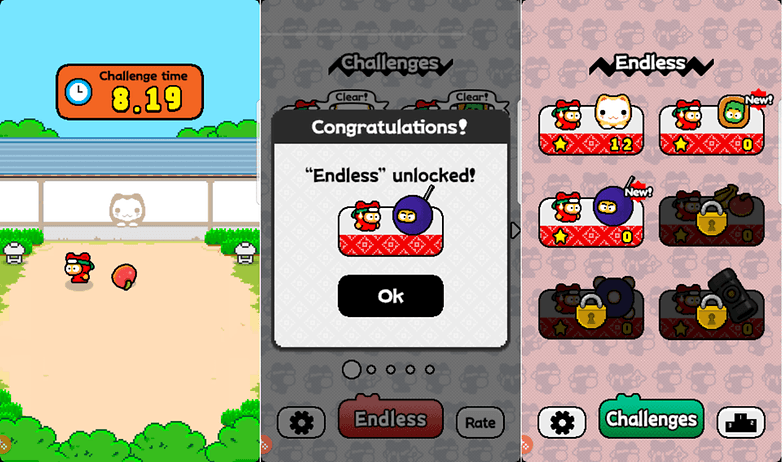 Ninja Spinki Challenges is a game very much in category of “cute looking but heinously difficult” that’s previously been occupied by games like Flappy Bird. And it uses the same blocky, retro graphics too, if that’s your bag. It does have a little more going for it than Flappy Bird though. In essence, whatever the level, the aim is to not come into contact with any of the various objects that come in your direction – these vary from bananas and other fruit to kittens. Exactly how you do that depends on which level you’re playing. On some, you can only move left or right by swiping at the screen, while on others you can move up, down, left and right. There are also other levels where you need to dispatch your enemies by throwing stars at them; you do this by tapping the screen behind your character. Simple, right? Nope. Not really. Sure, the first few levels aren’t too challenging but it’s not as straightforward as it sounds, so working your way through the 30 challenges will take a while. Along the way, you’ll also be unlocking new ‘Endless’ levels that just keep throwing enemies at you to see how high a score you can get. Ninja Spinki is free to download from the Google Play Store, and funded by ads. OK, hopefully you downloaded and enjoyed a simple, if difficult, few minutes/hours with Ninja Spinki, because the next game is just straight up odd and more than a little creepy. In a good way though, mostly. The game is the latest installment of a series, and it’s not one I’ve delved into before. Nonetheless, if you’re in the same position, jumping in at this point isn’t a problem, and the basic aim of the game is actually a little different to the rest in the series, as it turns out. The game’s also a port from the desktop version that remains a good-looking and sharply written title, but does lean a little too heavily on trial and error for some sections where the gameplay has been tweaked. You’ll literally find yourself fumbling around a room in the dark trying to work out what to do next. It’s in these moments that the game manages to deliver on its promise of sitting in the ‘horror’ genre, by effectively making liberal use of jump-scares featuring the deformed animatron creations. If you want a simple pickup-and-play game, this probably isn’t it, but find a dark room late at night and you might enjoy this one more.